Director Göran Olsson’s documentary, The Black Power Mixtape 1967-1975, has a clunky, cumbersome title; the name is like a topiary that needs reshaping. Something with more steely brevity, clenched fist punctuality would be more fitting of this snapshot of the Black Power movement in America. 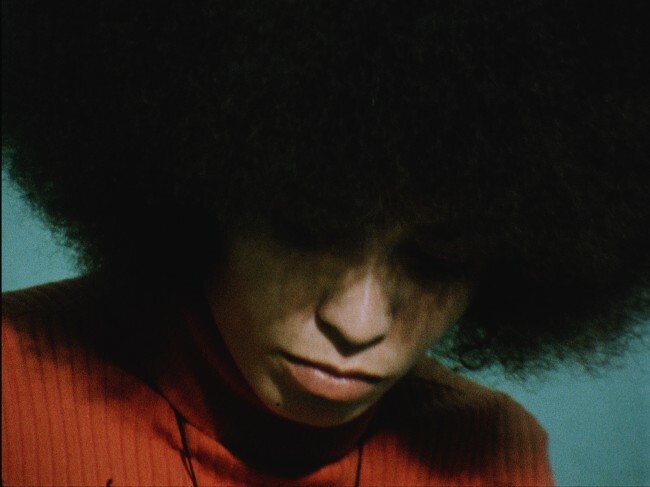 Olsson’s thoughtful doc is mostly composed of yellowed archival footage that Swedish journalists captured in the nineteen sixties and seventies, spun together with interviews from today’s black poet laureates and political thinkers, to make a tapestry of interwoven ideas, thoughts, images. Most of the documentary uncoils its rattling tail with a jazzy, minefield of drums and horns. The flickering images of the charismatic Stokely Carmichael – whose rail gun speeches as a member of the Student Nonviolent Coordinating Committee had tattooed the ears of national listeners – is shown, in his own home, away from the tumultuous podiums in which he emphatically denounced widespread prejudice, as a man who, even in the rest of his den, sparked with seething, albeit quieted, tension. Old film reels of activist Angela Davis are seen, too, with an afro as big as a wrecking ball, and a words as barbed as a junkyard fence. Many other players, whom were the phalanx of the Black Power movement, are seen, through a dirt specked lens, as this documentary unspools itself over its 100 minute running time. These dusty film reels, shot so long ago, are not only interesting as a living artifact for Americans, but the images, seen here in all of their fiery intensity, are captivating to watch because they were shot by Europeans. Davis and Carmichael are clearly the core of the apple, but syllable-gnashing emcees, such as lyrical wordsmith Talib Kweli, are important narrators in Olsson’s incandescent documentary. “The Black Power Mixtape 1967-1975” has its incensed romanticism, but the film is also proud, sad, wounded, and boundless in its curiosity. Olsson has created a documentary that is so frazzled and fragmented that it almost benefits from the fact that it is a staccato history, and not a voluminous stenography of events. The biblical style omissions in this film create a brick walled gravitas, a continuum of mystery and a resilience that can not be ironed out. It’s hard to imagine “The Black Power Mixtape” as unintentionally hiccuping through important events with Martin Luther King, Jr. and Malcolm X. The film is a companion piece to a volatile time in history; not so much a stand alone and sterile chronology of events in the fashion of Ken Burns. This sort of kaleidoscope is intended, most likely, to get viewers to not only thumb, insipidly, through history, but to get themselves involved in creating and understanding it through their own, personal, exploration. Because “The Black Power Mixtape” is a double barrel shotgun of syntax and style, there is a feeling that billowing cigarette smoke, from the lips of Angela Davis, isn’t so much tobacco fumes as it is the burning of a dynamite fuse. It is impossible to not enjoy, soak up, immerse yourself in these reels of film that have not been seen in America. Bobby Seale wades through a sea of photographers, Angela Davis telegraphs her words to uninformed reporters, Stokely Carmichael drops nuclear fission on microphones – you would have to have the stem of your brain removed to not feel the reverberations of these activists. Olsson’s documentary works because of the people inside of the film; not necessarily because of the way the director approaches its subjects. The revolution will not be televised, but it will be shown, theatrically, for a crowd that is interested in the source material.